We have had our Wildcat Sport for a while now and tested it in the dunes, rocks and trails and have been impressed with this little trail machine (see Wildcat Sport Review for more details). I figured it was about time to do a little customization to it like we do with most of our vehicles, then get it back on the trail to see how we did. Before we get into the details of the project, let me take a minute to remind you where this vehicle fits into the Arctic Cat lineup. The Arctic Cat Wildcat Sport is 110.5 inches long and 60 inches wide and fits in between the Wildcat Trail (110.5″ x 50″) and the Wildcat 1000 (128″ x 64″). 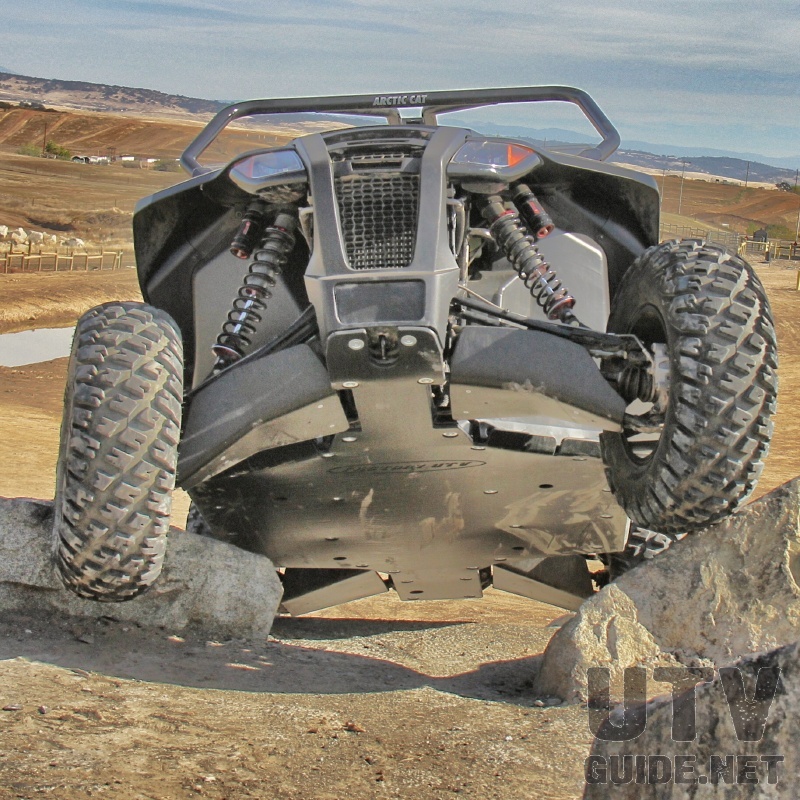 With it’s 60-inch stance, most would consider the Wildcat Sport to be targeted as a sport trail machine similar to the Polaris RZR S.
First thing we did before we did any rock crawling with the Wildcat Sport is to protect the underside with some UHMW protection from Factory UTV. 3/8″ UHMW skid plate and rock sliders did the trick and really do a nice job protecting the vehicle from rocks. UHMW is super tough and allows for some flex before returning to original shape. We have used this setup on many of our vehicles and can’t say enough about it. Next we wanted to add some ground clearance and the easiest way to do that is with a larger tire. The Wildcat Sports comes with Carlisle Trail Pro 26-inch tires and about 10-inches of ground clearance. I switched over to a 28x10R14 STI Roctane XS tire mounted on a STI HD5 Beadlock wheel with a red beadlock ring. The Roctane XS tire is an 8-ply tire but a bit lighter duty than the Roctane XD. With the Wildcat Sport being lightweight, this is more tire than I think we need, but I like having more rather than less. The Roctane XS measure real close to a true 28″, while the stock Carlisle are closer to 25″ so we gained about 1 1/2″ of ground clearance with this setup. To accent the red beadlock rings and spice up the look of the factory black without breaking the bank with a full wrap, we had Diamond Wrap Factory in Placerville CA add some red accents and some carbon fiber on the fenders. The simple addition makes the car pop just enough. Small Graphics Changes make the Wildcat Sport come alive. To give up some more light for night rides without going overboard on cost or complexity, we teamed up with Lazerstar Lights. We decided to add two 4-inch 5 Watt Endeavour LEDs in a flood beam pattern. These lights are small, but pack a punch and the flood pattern fills the area in front and to the sides of the vehicle well for great night time visibility. With this quick build completed it was time to hit the trail. With the weather in northern California hovering around 70 degrees, we thought it might be interesting to get one last run in on the Rubicon Trail. We have had a few winter storms come through, and the Rubicon Trails sits at 6,000+ feet in elevation, so there was some snow on the trail that made things a bit more interesting. Right away the extra ground clearance came into play with some rocks that touched the skid plate and almost got us high-centered. We were able to get the tires to grab enough to pull us over, but without the extra height, we would have been stuck. Engaging the stock front differential locker is a must when you get one tire off the ground. We left the factory TEAM Rapid Response Clutch completely stock, and it seemed to handle the larger 28-inch tires without slipping the belt. And low-end take offs felt very reasonable. With that large of a change in tire size and weight, an adjustment would probably help the Wildcat Sport perform better, but it did well enough that we may just leave it stock. Overall, I couldn’t be more thrilled with how this quick build has turned out. We didn’t go crazy on changes and that really helped to get us back on the trail quickly. Most everything we did add or swap out was a simple bolt-on part and that makes all the difference in the world. The Wildcat Sport is a very nimble machine. 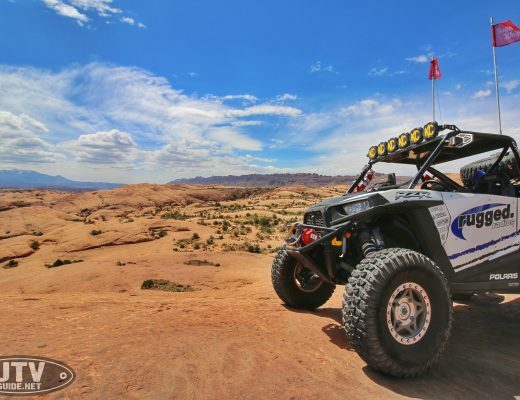 It checks in at more than 100 lbs less than the RZR S 900 which makes the power-to-weight ratio very competitive. And being lightweight makes rock crawling that much easier. This trip made us wish for summer again so we could get back on the Rubicon for a longer ride covering more of this beautiful trail. If you would like to follow our build, check out Wildcat Sport Buildup and be sure to follow us on UTV Guide Facebook and Instagram/Twitter at @utvguide.